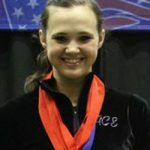 Ashleigh Gnat, 17, is a high school senior from Lake Mary, Fla., who has been involved in gymnastics since 1997. Her older sister, Jeana, and both of her parents competed in gymnastics. In fact, her parents opened up their own gym, ACE Gymnastics, near their home in Florida, and Ashleigh has grown up around some of the world’s best athletes. “I was always in the gym with my sister and my parents. It just came easy to me,” Ashleigh said. As a senior in high school, Ashleigh’s next step is competing at a collegiate level. Her sister, Jeana, competed for the University of Alabama from 2001-2004. Ashleigh wanted to stay in the SEC, arguably the most dominating gymnastics conference in the country, and compete with the best. On National Signing Day, Gnat signed her letter of intent to compete at Louisiana State University, which happens to be her father, Ray’s alma matter. Floor and vault are the favorite events for Ashleigh to compete in because it allows her to show power and confidence. Ashleigh competed in last years’ Nastia Liukin Cup after finishing first in the Presidential Classic. 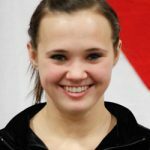 In 2012, she also placed first at the National Gymnastics Challenge and earned the all-around title at the State Championships. For Ashleigh Gnat, getting started in gymnastics was easy. Her parents own a gymnastics facility, and her father, Ray, is also her coach at ACE Gymnastics in Longwood, Fla. Her whole family is involved with gymnastics: her mother, Joan, participated in the 1972 Olympics in Munich, Germany, and her father Ray was a college gymnast at Louisiana State University (LSU). Her older sister, Jeana Rice, was a member of the USA Senior National Team and went on to become the 2004 NCAA all-around champion for the University of Alabama. And Ashleigh continues with the family tradition of successful gymnasts as she has already verbally committed to LSU on a full-ride gymnastics scholarship. “I like the team and the environment, and it was the best fit for me,” the 17-year-old from Lake Mary, Fla., says. She will be majoring in business. Her goals for her college gymnastics career are to become an All-American and to win the NCAA championships with LSU. Ashleigh names the 2011 Regional Championships, where she won all four events and the all-around as the biggest accomplishment in her gymnastics career. She also placed first on vault at the 2011 State Championships. Ashleigh qualified for the Nastia Liukin Cup at the Presidential Classic in Buena Vista Lake, Fla., where she won vault, bars, beam and the all-around. “My goal for the Nastia Liukin Cup is to hit every event, not to fall and do the best I can,” she says. This will be the second time that she is competing at the Nastia Liukin Cup. In 2010, Ashleigh finished 21st place in the all-around with 36.450 points. In her free time, Ashleigh enjoys art and drawing, and she plans to take art classes in college.